On Sale: A Blind Date with Your Infinitely Creative Mind! Grab Your SALE Copy Now! A Blind Date with Your Infinitely Creative Mind! The brain can make more connections than all of the atoms in the universe! Our brain is wired for infinite creativity! Take a vacation from the stress of fast-paced living , overwhelming information and the 50,000 thoughts you think each day. 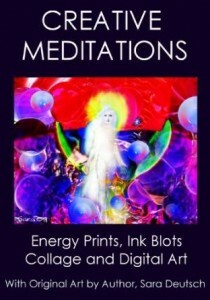 Five minute creative meditations with energy drawings, ink blots, mind maps and collage boost the immune system, reduce stress and pain, lower blood pressure, promote sleep, and ease depression and they’re FUN! They awaken our whole brain to remember WHO we are–infinitely creative beings with the power to change and heal!